After much back and forth discussion, Ted and I finally settled on the name Bindi as a tribute to the late and great Steve Irwin (1962 – 2006). He was an animal lover, a wildlife expert, a conservationist, and he was fully passionate about all forms of life. He named his own daughter Bindi, a word from the southern Australian Aboriginal Pitjandtjara language meaning “awakening”. We cannot think of a better name for our little Bindi because that is indeed what she is for us: an awakening. Seeing her birth and seeing how Bessie, and now Beef, react to her, care for her, and love her goes beyond anything we ever imagined. 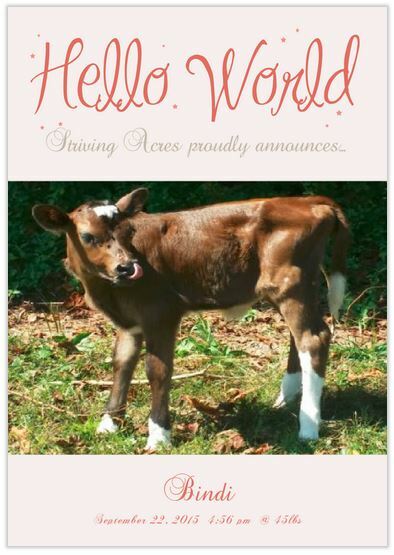 Our little Bindi’s birth has renewed our commitment to run an ethical and humane farm for all of the animals here. We will never be wealthy by society’s standards because of the affirmation to live by this commitment, but in the ways that matter, we are rich beyond belief to simply be part of the circle of life and to perhaps inspire others to realize that you, too, can live this wonderful life-altering dream.